Diageo has launched Fridge Magnet, a television commercial for Guinness filmed in Buenos Aires. 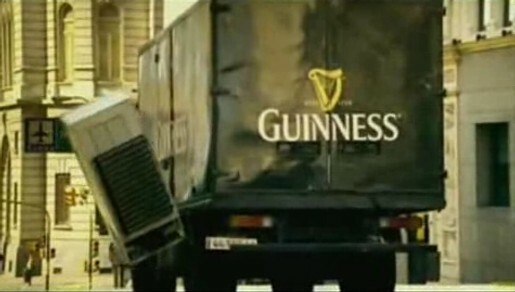 Pedestrians on the streets of Buenos Aires stand stunned as they see hundreds of fridges propelled through the air, drawn to the irresistible Guinness delivery truck parked in the centre of town. The Fridge Magnet campaign was developed at IIBBDO, Dublin, by creative director Mal Stevenson, art director Pat Hamill, copywriter Mark Nutley, agency producer Onagh Carolan. Filming was shot by director Fredrik Bond via Sonny, London, with director of photography Crille Forsberg, producer Ran Holst. Post production was done at The Moving Picture Company, London and Los Angeles, with producer Scott Griffin, 3D supervisor Duncan McWilliam, and 2D supervisor Frank Lambertz. Editor was Tim Thorton-Allan at Marshall Street Editors. Music is “Destination” by Welsh band My Red Cell.